This week, one of the country’s greatest ski racers ever is competing at the Vancouver 2010 Games. He hails from Franconia, N.H., and has a hell-bent, go-for-broke style that sometimes wins him gold and sometimes gets him in trouble. Huh? Wasn’t that Bode Miller — last month? Nope. This is Tyler Walker, a 23-year-old athlete who just happens to share not only the hometown of the five-time Olympic medalist, but also his talent for flying downhill at highway speeds. Unlike Miller, however, Walker has no legs. He uses a monoski to shred faster and more ferociously than most anybody — able-bodied or otherwise — and he’s representing New England, and the U.S., at the Paralympic Winter Games. If you haven’t heard of the Paralympics, you’re not alone. Though they’re staged at the same state-of-the-art sporting venues as the Olympic Winter Games, and though they see the same world-class level of competition, the Paralympics have long been overshadowed by the Olympic extravaganza, and sometimes misunderstood. 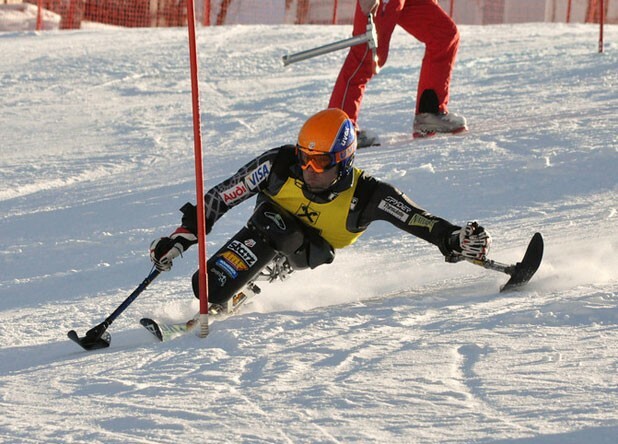 When Walker was 12, he entered his first ski race, competing against members of the U.S. Adaptive Ski Team. “I figured out pretty soon that ski racing could get me all the way to the Paralympics,” he says. And sure enough, after winning multiple World Cup races and two gold medals at the Winter X Games in Aspen, Walker now finds himself in British Columbia surrounded by more than 500 other athletes from 45 countries. Smaller and more intimate than the Olympic Winter Games (for which more than 2600 athletes descended on Vancouver to compete in 15 different sports with multiple disciplines), the Paralympics are mostly clustered in the pretty alpine village of Whistler. There are just five sports — alpine skiing, cross-country skiing, ice sledge hockey, wheelchair curling and biathlon. The U.S. has sent 50 athletes to the 2010 Paralympic Winter Games. Though none have Vermont roots in the strict sense, the Green Mountain State has helped pave the way for the Paralympics’ success, thanks to monoskiers Sarah Will, who grew up skiing Pico Mountain, and Chris Waddell, a Middlebury alum. What’s more, Vermont Adaptive has become one of the premier feeder programs for aspiring ski racers. Serving nearly 1300 kids and adults who have disabilities, the Killington-based organization gives some 3000 ski lessons every winter. “We’re growing — Vermont is building this really cool thing to help folks jump on track for competition, for whatever goals they set for themselves,” says Vermont Adaptive’s executive director, Erin Fernandez, who gives partial credit to the Wounded Warrior Project and other veterans’ programs for adding a new dynamism to disabled sports. “The Paralympics are making huge progress — leaps and bounds,” says Fernandez. Because fewer than 5 percent of people who have physical disabilities play sports, she explains, young kids may feel the greatest impact of this increased awareness. They experience a “touch-the-rings” moment, says Fernandez, when they realize that learning to, say, master a monoski could help them become part of something much greater than themselves. The Paralympics still need to make progress in a couple of areas. For instance, there’s a problem facing most Americans who hope to witness an actual touch-the-rings moment from the Vancouver Paralympics: Instead of airing daily competition, NBC is showing just a two-hour “highlights” program — and not until April 10. But Paralympic fans with cable access can now catch the action at 6 p.m. each night through Tuesday, March 23, on Universal Sports, and others can watch on-demand re-airs of the TV coverage at www.universalsports.com. For their part, some participants in Vermont Adaptive are witnessing the Paralympics firsthand, thanks to the fact that Burke was one of six coaches and program leaders nationwide chosen to travel to Vancouver. She’s bringing 13 student athletes with physical disabilities. And the Games they’re watching are the Olympics without the hoopla — security forces are reduced, travel restrictions on the Sea-to-Sky Highway to Whistler are gone, and tickets are widely available. The event organizers hope more average Joes will get a chance to witness some way-beyond-average feats. As Walker races, sure, he’s thinking about gold. But he’s also thinking about some of the kids watching him. Three years ago, a family from Qatar whose 8-year-old son is also missing much of his spine contacted Walker to ask him about disabled sports. He ended up visiting Qatar several times, once to attend a symposium on incorporating elite-level adaptive sports in university curricula.